Raiders of the Lost Ark Turns 30! Since this month marks the 30th Anniversary of Raiders of the Lost Ark hitting theaters, I’m sure you know all about the adventurous Indiana Jones. Part professor, part archeologist, all daredevil, Indiana Jones is ready to take on the whole Nazi regime in order to get to a sacred, mysterious, all powerful Ark of the Covenant before they do. Enjoy these new Tween & Teens Movie Night Activities with an old classic. *Everyone knows Indy by his signature hat, jacket and whip. Don your most best copy-cat outfit and get ready for adventure. 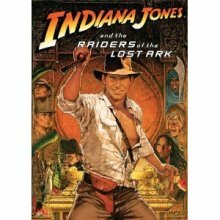 *Since a lot of the movie takes place in Egypt, dress up like Indiana does while he’s there by wearing a long rob and a turban. *Make it look like you’re in an Egyptian market watching a movie. Place baskets and barrels around the room, drape fabric from the ceilings and tables, and as it gets dark light candles. *Use boards to block off part of your room as part of your own excavation site. *For dinner, serve up Indiana Scones. Have lots of different toppings like chili, lettuce, tomatoes, salsa, sour cream, black beans, cheese and more. Be sure to save room for some with honey or powdered sugar. *As snacks, have gummy worms (to represent the feared snakes) and spiders. Also have some dates out, just make sure they don’t get poisoned. *Indy is always piecing together clues and maps to find just what he’s looking for. Have everyone draw a picture, map or message then tear or cut them all up. See if you can piece them all back together or see what new creations you can make. *Write secret messages on your eyelids like one of Professor Jones’ students does. *Get a large map of the world and a different color yarn for each person then map out a trip of your own with stops at each place you’d like to visit around the world. *Have your own archeological dig: hide secret treasures in your garden, yard, sandbox or even at the playground and have your family or friends try to find them. Turn it into a scavenger hunt by leaving clues buried in multiple places, with a fun treat or surprise at the end.